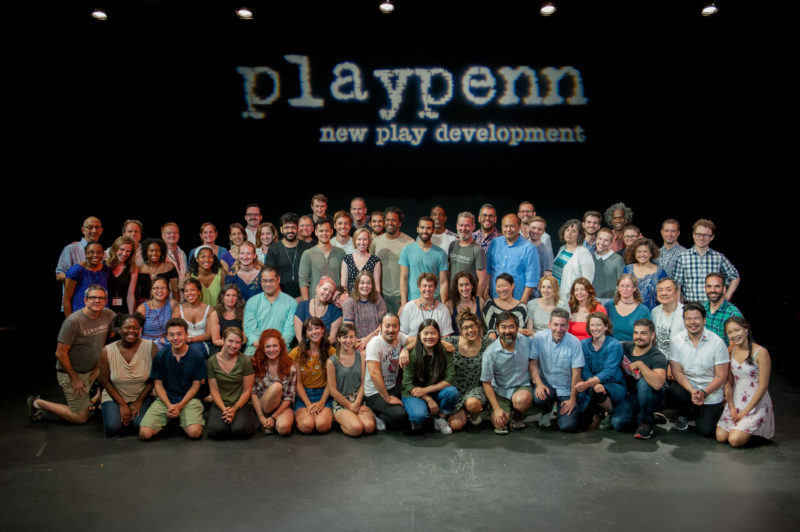 PlayPenn’s application period for the 2019 New Play Development Conference is now closed. Thank you to all who shared a script with us. Play selections will be made in the Spring of 2019. The application period for the 2020 New Play Development Conference will open in September 2019. At that time, we’d be pleased to receive your full length, unproduced script for consideration. Currently, we do not consider musicals, plays for young audiences, or one-person plays. Keep up to date on Conference news by signing up for our mailing list, or find us on Facebook, Twitter, and Instagram. An original script in .pdf format with no identifying information (no name on the document). Applications that are submitted in non-pdf format will not be considered. A casting breakdown and the number of actors required (pdf) (no name on the document). Please do not assume that doubling schemes are obvious. We want to know how many actors your play requires in a workshop setting. The play’s development and production history (pdf) (no name on the document). Plays that have had readings are eligible. Plays that have been produced or that have been through multiple development processes are not eligible. List three areas of challenge in your play that you’d like to address while you’re at PlayPenn. Please be specific. PlayPenn does not accept agent submissions. The 2019 conference will be held in Philadelphia, PA from July 9-28, 2019 at The Drake Theatre. Invited playwrights will have the opportunity to work with a director, dramaturg and Philadelphia-based, professional actors over a 20-day period that allows for 29 hours of rehearsal and staged reading time along with ample time to reflect and write. The work will begin with a three-day roundtable (July 9-11) that will help in laying the collaborative groundwork for the development time ahead. The conference includes two public staged readings that are intended as a part of the process, giving playwrights an opportunity to measure the efficacy of the work accomplished and provide an opportunity to gauge the work ahead. PlayPenn will provide travel for casting, travel to and from the conference, housing, per diem and a stipend. Applicants should be aware that we are a development conference rather than a festival or showcase for new work. The distinction is important and meaningful to us in the current climate of the increasing commercialization of play development. We work to avoid participation in what has become known as “development hell” by placing authority in the hands of the playwright and fostering an environment in which risk is rewarded and honest assessment is encouraged and provided. To that end, we focus on the needs of the text. The public Conference readings are intended to present a glimpse into how the text lives off the page rather than how the play might be augmented or staged in production. "I wish all new play festivals would use PlayPenn as the model: a focus on the work not the product, incredible artistic support, and plays selected on their merit instead of the length of the author’s resume. For me, the result of my time at Play Penn was a script that was ready for it’s first production at Quantum Theatre in Pittsburgh. The production received amazing reviews, and will go on to full productions at Two River Theater in NJ and Rivendell Ensemble in Chicago this coming Spring. I also left with a slew of new wonderful colleagues whose help and opinions continue to be a part of my professional process and whom I also count among my friends. "